All editions of EaseUS Todo Backup except Technician edition. This article includes the download links of EaseUS Todo Backup series trial products, the online/offline methods to activate the trial with your code,and the steps how to upgrade when there is a new version available. In addition, some clues to solve an Invalid code issue can be also found in this article. It is strongly recommended you to bookmark this article if you have a full license of EaseUS Todo Backup, as you may need it someday after a new version releases. Due to different license agreement of Technician edition, the users who own this edition have to write an email to support team to get the details about download, activation and upgrade. The trial download links for most editions since 6.1 listed below. The trial is full functional for 30 days from V7.0 version. For what is new in each version, please see Version History. For the detailed comparison between different editions, please see Home editions difference and Business editions difference. After ordering a full license, a code which consists of 25 letters/digits will arrive soon in an order confirmation email. With this code, you are able to activate a trial to full. This method applies to Internet connected computers. The first time you run a trial product, an activation box will pop up. If the activation box was skipped, you can also click Upgrade Now button on the home page to get the box again. Entering your code with copy and paste in this box and clicking Activate now will break the 30 days' limitation of the trial on your computer. 2. All codes can be only accepted by its corresponding trial version. For example, the code belongs to Home edition cannot be used to activate workstation trial. 3. Code of 5.X cannot be used in 6.X versions. Except for the code of lifetime license. 4. Free version can only be upgraded (activated) to Home edition. 5. In some special environment, you may get a message the code has been used even this is the first time you try. In this case, you may try the solutions below. Disable all security tool and try to activate again. Physically disconnect the computer from Internet to have an offline activation. If you are entitled to get a newer version for free based on our upgrade policy, you can directly download the corresponding trial version from Download section, and follow the activation guide to get a full copy with your code. The installation process of the new version will remove old version automatically, and all your backup tasks will be preserved. If you want to get a major upgrade, like upgrade from 5.X to 6.X, you have to contact our Sales team to get the order link. Please be sure to include your order ID of previous version in your email. Since version 7.0, online-updating is added, you are able to get a new version without downloading another installation file again. 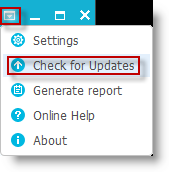 Click Check for Updates can help you check and start downloading if there is a newer version available. However, a major upgrade still requires a new code and purchase.